Today, with the release of his Minecraft game Big Block Island, Tyler Pappas — better known by his YouTube handle Logdotzip — becomes the first YouTuber to build a development team and release a game on Microsoft‘s Minecraft Marketplace. Pappas, who over eight years of uploading Minecraft videos on YouTube has gathered more than 2.7 million subscribers, developed Big Block Island with Pathway Studios and the team at his newly-formed gaming studio Dotzip Developments. The game is one of a number of Minecraft ‘worlds’ — unique gaming environments within Minecraft that are open for players to explore — available on the Marketplace, where Minecraft players can purchase everything from in-game looks for their characters (called ‘skins’) to real-life branded merch for themselves. Players who explore Big Block Island will find a giant theme park where they can interact with NPCs — for which Pappas brought in voice actors — and one another to uncover the park’s many secrets, including more than 50 collectible items. Getting a game like Big Block Island on Microsoft’s Marketplace is no easy feat. Developers who want to put their creations in the Marketplace have to apply to join Microsoft’s Minecraft Partner Program — and to be part of the program, they must have a registered business to enter into a formal partnership agreement with Microsoft and Minecraft‘s developer Mojang (which Microsoft acquired in 2014 for $2.5 billion). Partners also must have created and shared high-quality content with the Minecraft community in the past, like character skins or even full-fledged worlds. Pappas, who did multiple brand partnerships with Mojang as a YouTuber, was one of the first creators Microsoft approached to become a partner when it first launched the Marketplace in 2017. Big Block Island is the first game to come of that partnership, but it’s definitely not the last. Dotzip Developments already has four more Minecraft games in the works — and starting next year, the studio will also offer its game development services to other Minecraft enthusiast YouTubers who need a partner studio to help them take the leap from player to creator. Check out our chat below about what that leap was like for Pappas and how Dotzip Developments will work with YouTube movers and makers to build their ideal Minecraft content. Tubefilter: How long did the development process for Big Block Island take? Tyler Pappas: Big Block Island has been in development for a whole year as of this week. It’s a good chunk of time to be in production, but it’s important to note it’s only one of five projects that we’re currently mid-development on. Over that course of time, we have also built out a great team of developers to help us create said projects. When you start something new, there are always challenges to take on and hurdles to overcome. But for me, that’s where a lot of the joy comes from. 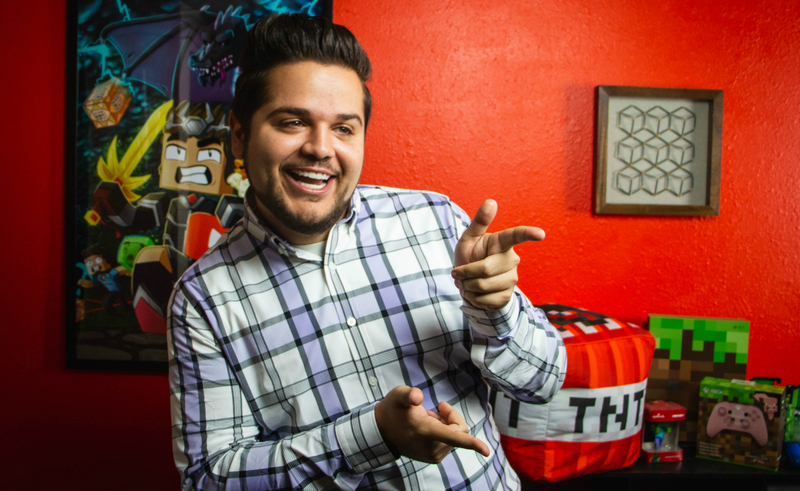 Tubefilter: What made you decide to join the Minecraft Partner Program and create games? TP: I’ve dreamed of making video games as long as I can remember. I recall drawing up dungeons and game levels in my composition notebooks when I was eight or nine years old. When you’re a kid, the creative juices really flow because you’re not yet thinking if something is “possible” to do from a technical or logical standpoint. It’s not your concern. You have the whole thing planned out in your head: every power-up, every pitfall. Now my team and I actually get to make those dreams a reality. Tubefilter: Why is Dotzip Developments an ideal partner for YouTubers who want to make Minecraft games? TP: As a YouTuber, I understand the importance of creating dynamic content for your viewers that they love to engage with. With our background and experience in coding up our own concepts and features for video, our development team is a natural fit for any YouTube creator who’s looking to step into the market. It’s a big undertaking to build out a team and manage the production process of a game that needs to meet all of the quality standards Microsoft expects when distributing in their Marketplace. We want YouTubers to do what they’re good at, which is coming up with creative concepts and ideas and leave the back-end logistics up to us! When a creator partners with Dotzip Developments, they’re not only getting the support of our development team, but they also get to take advantage of our post production team as well as our executive team helmed by James Haffner, which has extensive experience overseeing large scale project rollouts from multiple distribution partners. Big Block Island is available here. It costs 1170 ‘Minecoins’ — Minecraft‘s in-game currency, which can only be obtained by purchasing packs of coins with real-world money — or about $7 U.S. How revenue is split between Microsoft and its partner creators is confidential, but creators are paid out in real-world money. More information about Dotzip Developments will be available closer to the studio’s full launch in 2019.